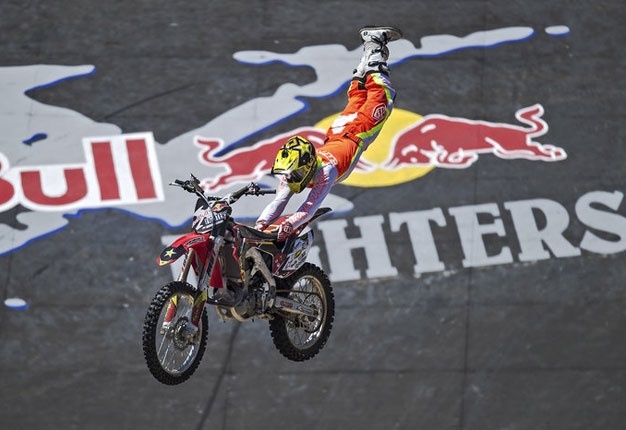 Red Bull X-Fighters is a Professional Freestyle Motocross (FMX) tour. Participation in a Red Bull X-Fighters competition is by invitation only, based on past year's results, current season ranking, selection by Ranking Committee and Wild Cards. 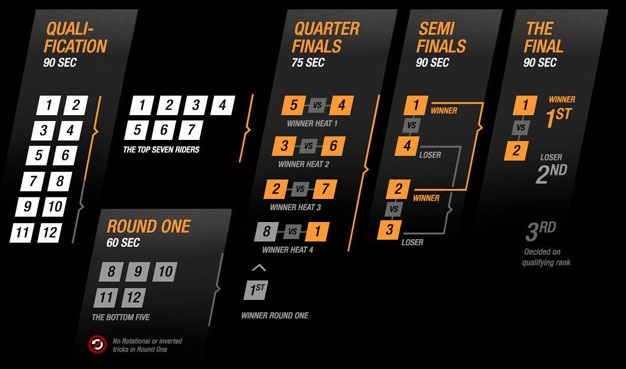 The Qualification before each event sets the brackets for the main event. The main event is based on a Head to Head competition. Judging in all rounds will consist of 5 judges, each one judging different criteria. On each stop the riders earn points for the World Tour ranking. The top seven riders Ranked highest in qualifying automatically progress to the Quarter Final of the main competition. The bottom five battle it out in Round One for the right to compete in the head-to-head rounds. Just one rider progresses as seed #8. In Round One inverted or rotational tricks such as Backflips, 360's or Body Varials are typically aloud. However each rider is allowed a single unrestricted "Joker trick"
Each Red Bull X-Fighters Event is Presided over by five judges, who each mark the riders in one of five categories, these are variety, execution, style, course and energy. In Qualifying and Round 1 Qualifying judging panel comprises 5 judges, plus one Head Judge. These judges will award each rider a score from 1-100 points. Final score will be represented as a number from 0 – 100 based on an average of all 5 judges' scores (From a total of 0 - 500 ÷ 5 judges). Round 2 to Final – Head to Head competition Each judge will award each of the paired riders a score on a scale of 1-100 points. The rider in the pair with the highest score from a single judge will win that judge's vote. The rider who gets 3 or more judges' votes out of 5 will win the match-up. * THE THROW OUT RULE: The Throw Out rule applies to all riders who compete in all Tour competitions prior to the Final stop. The lowest single Tour stop score will be thrown out and the remaining stops will be totalled to give an adjusted points score, beginning after the completion of Tour stop #2 and continuing after each event prior to the start of the final stop. All points for the Final stop will count. Click here for the official rules breakdown.